Recap: If you hadn’t noticed yet, Nvidia’s new flagship the Geforce RTX 2080 Ti is an extremely powerful GPU. As legendary overclocker Kingpin just proved, it’s also the most powerful GPU ever when pushed to the max. 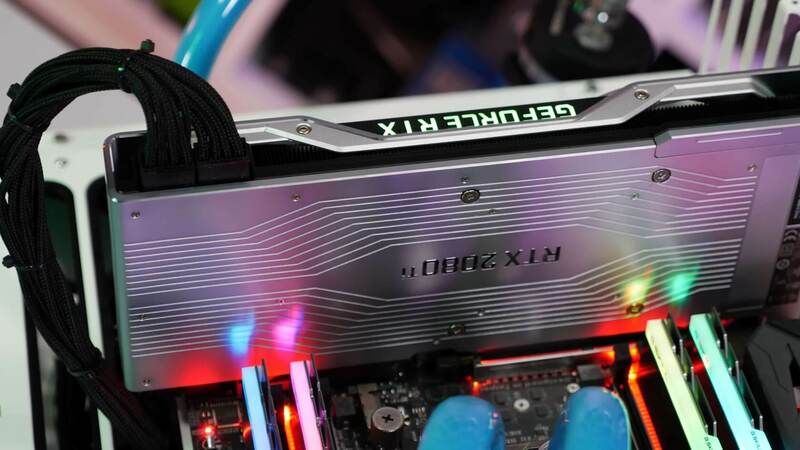 By using liquid nitrogen cooling and bypassing the card’s voltage limits, Kingpin dialed the clock speeds of his 2080 Ti all the way up from 1545Mhz to 2415Mhz and its memory speeds from 7000Mhz to 8683Mhz. He paired it with a liquid nitrogen cooled i9-7980XE running at around 5.7Ghz, and subsequently broke every record he attempted in 3DMark. Beating Titan V in all these tests, he took Time Spy Extreme by 5%, Time Spy Extreme Graphics by 5.5%, Time Spy by 12.5%, Time Spy Graphics by 13.5%, Firestrike Ultra by 11%, Firestrike Extreme also by 11% and standard Firestrike by 10%. That’s pretty impressive on Nvidia’s behalf considering that the Titan V has 17% more cores and is only 100Mhz slower at factory settings. While Kingpin managed to increase the performance by 20%, you don’t need liquid nitrogen to see serious gains by overclocking an RTX 2080 Ti as YouTuber JayzTwoCents proved when he climbed to number 15 on the Time Spy Extreme ladder at only 2175Mhz. Even though the RTX 2080 Ti is the most powerful graphics card money can buy (quite a lot of money in fact, at $1,200 for the Founder’s Edition), don’t go expecting Kingpin’s performance on your own card when they release on the 27th. To get the most out of your RTX card, though, stay tuned for TechSpot’s upcoming RTX 2080 Overclocking guide.